I just finished getting tossed around like a rag doll by Ford’s new Shelby GT350R. The Ford dynamics and vehicle integration engineers showed no mercy as I sat there in the passenger seat turning blue. It was awesome. The 2016 Shelby GT350 is truly a special beast. The flat-plane-crankshaft-having 5.2L naturally aspirated V8 is the Mount Vesuvius of engines, powerfully erupting with a slight touch of the skinny pedal. It’s always hard to gauge a car’s abilities just from the passenger’s seat. But in a car this visceral, a car this stonkingly loud and powerful, you realize real quickly what it’s capable of. While the 526-pony volcano scoots the 3650 pound Shelby down the road with fervor, it’s really the sound that belches from those exhaust pipes that makes me weak at the knees. In trying to describe the beautiful scream of that V8, I came up with the following phrases that are ever so popular among modern youths: “I literally just can’t,” and “I can’t even.” And so on. It may be because I’m relatively new at this whole auto journalism thing, but I must have ridden around that track nearly 15 times while many of the other journalists called it quits after about five or six tries. Why would anyone stop? The cars were just sitting there awaiting their next passenger. Taunting me. I simply couldn’t get enough. The noise. The grip. The speed. I pushed through my notoriously weak stomach and enjoyed every moment. Despite its heft, the GT350R felt poised in the turns. 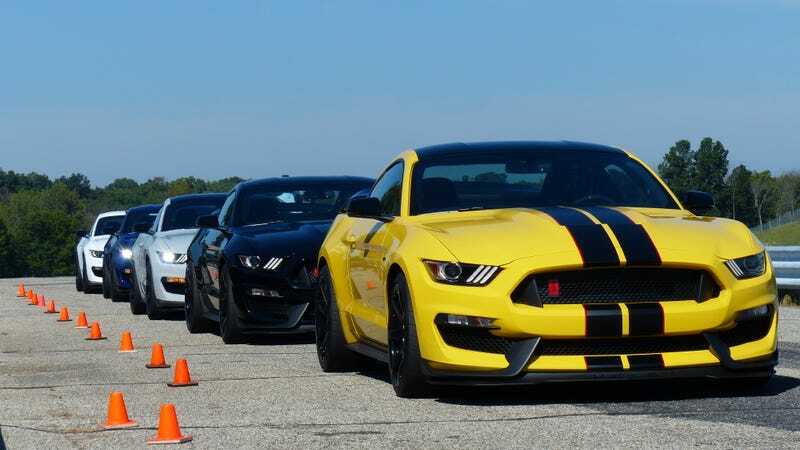 It’s no surprise that Ford’s Vehicle Integration team chose to design the GT350 to compete against the Porsche GT3 and Camaro Z/28. In fact, Ford claims that around Grattan, the Mustang outpaces the Camaro and stays neck and neck with the Porsche. I’m not surprised. The low unsprung mass (thank you carbon fiber wheels), coupled with the adjustable dampers and Michelin Pilot Sport Cup tires meant that those tires were always grabbing hold of asphalt, refusing to let the car succumb to centrifugal tendencies. Straight line acceleration in the GT350R made me glad I was wearing a helmet, because every time the driver mashed the pedal, my head flung against the seatback. Those wide sticky Michelin tires made the most of those 526 horsepower and acceleration happened without too much drama from those rear tires. Even though I’m sure the drivers were taking it easy on us wimpy journalists, that 5.2L V8 scared the bejesus out of me. I wish I could tell you more, but I’ll leave that for when we get in the driver’s seat. That can’t come soon enough.